Corned beef is a favorite in my family, and has been for generations. Until I was older, the only corned beef I knew, came in a can. My mom would use the canned corn beef to make a stew, adding potatoes and onions and becoming a meal. My mom would also bake some homemade bread or 'hoe cakes' with butter to round out the meal, a very filling and satisfying one, made with love. This was welcome and warming to our bodies, during the harsh winter months of days old. This was a way my parents stretched what they had to feed the brood, which consisted of their many children, as well as some of their siblings' children. We also had a massive garden and livestock, so most of our food was literally organic and homemade, winning! We had a large extended and blended family. I was never as fond of corned beef then as I am now. 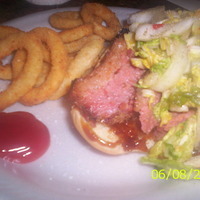 Later in life, I discovered the corned beef pictured above. I have been smitten ever since. 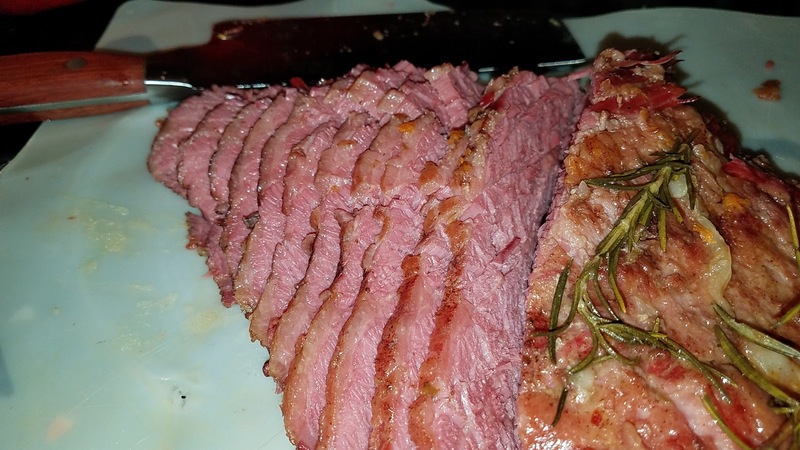 I usually take my corned beef brisket and rub it with a spice blend I created called Neillio's Grub Rub, then refrigerate overnight, then smoke and grill the amazing piece of protein for several hours, then finish in the oven. I would serve this masterpiece on a hot dog roll with a Warm Asian Slaw I created as well, and a slathering of jazzed up BBQ sauce. The following recipe is my "lazy day" brisket and doesn't require nearly as much commitment, but the satisfying results will not give it away. This is a one pot meal, based mostly on timing, as opposed to technique. It is a simple and rustic rendition of a pot roast of sorts. The cooking flavorful cooking liquid will serve as the vehicle to steam and stew the potatoes and butternut squash. For best results, it is advisable to let the brisket cool at room temperature for at least 20 minutes before slicing. Make sure your knife is sharp. In a heavy bottomed pot or dutch oven with lid, over medium high heat, drizzle bottom with olive oil when hot, SPST and sear the brisket on both sides, about 2 minutes each side. Add stock until brisket is just covered. Reduce heat to medium, cover with tight fitting lid and cook until fork tender, about 2 1/2 hours, or until easily flaked with fork. You may have to add more stock during the cooking process. 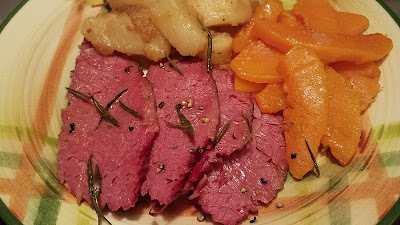 After brisket is just tender, add potatoes, rosemary and red pepper flakes. The liquid should be minimal at this point, about 1 inch. TASTE the cooking liquid for saltiness, if too highly seasoned, dilute with a bit of water. The potatoes will take about 20 minutes to stew in liquid. Before potatoes finish cooking, gently push them off to one side of the cooking vessel. Add the butternut squash to the other side during the last 5 minutes of cooking the potatoes. Add 2 pats butter to finish. Remove veggies before attempting to remove the brisket, to help veggies retain shape. Serves 4, plus brisket for later!